As shown in the figure below, the average numbers of registered parishioners and Mass attenders reported by pastors vary by region. 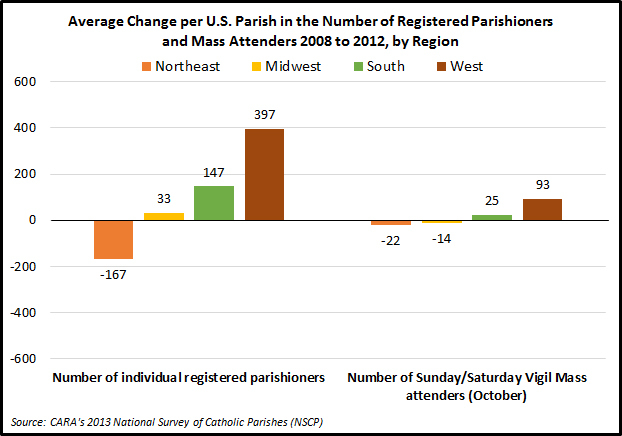 If you are in a typical parish in the West you have likely seen significant growth in the number of registered parishioners (+394) and Mass attenders (+93) since 2008. To a slightly lesser extent this is also occurring in the South (+147 registered and +25 attending). Thus, Catholics working in parishes in the South and West are more likely than those in other regions to "feel" the Church growing. By contrast, those in the Northeast may find reports of growth in the Church unbelievable based on their own personal experience. In this region, a typical parish has lost 167 registered parishioners and 22 Mass attenders since 2008. Parishes in the Midwest are also likely seeing fewer in the pews on Sunday (14 fewer attenders) but are not experiencing the same losses in registered parishioners (+33) as Northeastern parishes, on average. These changes are part of a long process of population realignment in the Catholic Church in the United States (problematically, parishes have not similarly realigned). In the last 65 years or so Catholics have left urban areas and parishes (i.e., historically Catholic immigrant communities) in the Northeast and Midwest for suburban homes and parishes or have moved even further into the "Sun Belt" in the South and West. Both migration and immigration have been important with new Catholic immigrants more often residing in the South and West as well. In 1950, 24% of Catholics in the United States lived in the South and West combined. Today, these two regions account for 49% of the Church's U.S. population (for more about these changes in a broader context see this recent post). It's as if two Churches are simultaneously emerging in United States. One is closing parishes and feeling decline while the other is bursting at the seams (...and the news media too often seem only interested in telling one of these tales). The research was made possible through funding provided by SC Ministry Foundation and St. Matthew's Catholic Church in Charlotte, NC. In October 2013, CARA began sending invitations to 6,000 randomly selected parishes (5,000 by email and 1,000 mail) to take part in the National Survey of Catholic Parishes (NSCP). Stratification was used. 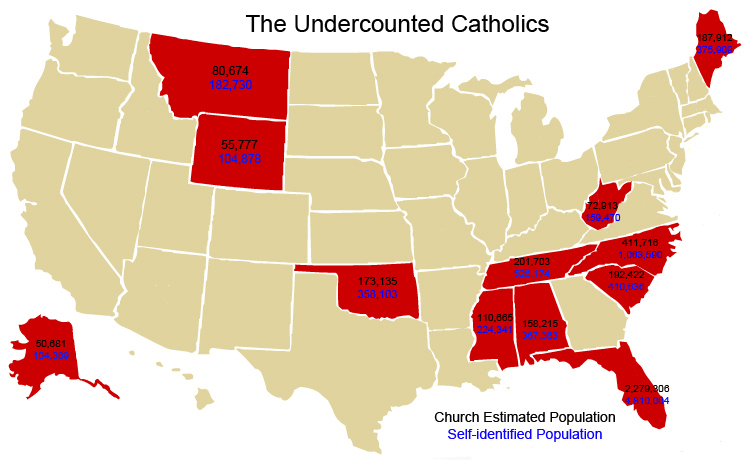 The total number of parishes randomly selected in each diocese was determined by weighting the diocesan averages of the percentage of the Catholic population and the percentage of Catholic parishes in the United States in each diocese as reported in The Official Catholic Directory (OCD). This stratification ensures that parishes representing the full Catholic population were included rather than a sample more dominated by areas where there are many small parishes with comparatively small Catholic populations. A total of 486 email addresses were not valid and 68 of the mailed invitations were returned as bad addresses or as being closed parishes. Thus, the survey likely reached 5,446 parishes. The survey remained in the field as periodic reminders by email and mail were made until February 2014. Reminders were halted during Advent and the survey closed before Lent in 2014. A total of 539 responses to the survey were returned to CARA for a response rate of 10%. This number of responses results in a margin of sampling error of ±4.2 percentage points at the 95% confidence interval. Respondents include those returning a survey by mail or answering online. The survey consisted of 169 questions and spanned eight printed pages. A slightly smaller national CARA parish survey, including 141 questions from 2010, obtained a 15% response rate. Response rates for CARA parish surveys are correlated with the length of the questionnaire. Responding parishes match closely to the known distribution of parishes by region. Data for sacraments celebrated also match the OCD closely. Two years ago we highlighted the importance of the “new Catholic vote” and the “God Gap” in presidential elections. Americans without a religious affiliation, often referred to as “Nones,” are as important to the success of the Democrats in presidential elections now as Catholics were to Democrats in the early 1960s. With the Nones growing in number this will likely become a stronger advantage for Democrats in the years ahead. However, before anyone starts running for president again there is another religious wrinkle ahead in the 2014 midterm elections. In many cases, the Democrats are contesting the 2014 Senate elections as a visitor on the Republican Party’s more religious home field and this may lead to a loss of their majority. The cohort of Senate seats that are up for election in 2014 includes many states where residents say “religion is an important part” of their daily life (“somewhat” or “very” combined). When more than 70% of a state expresses this, more often than not, they vote majority Republican. 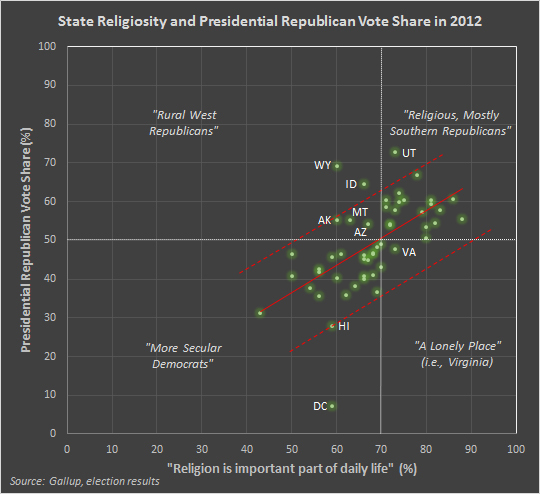 The scatterplot below shows the 2012 percentages of adults saying religion is an important part of their daily life (“somewhat” or “very” combined) for each state on the horizontal X-axis (source: Gallup) and the percentage of a state’s voters casting ballots for Republican presidential candidate Mitt Romney in 2012 on the vertical Y-axis. The data fall into four sections. On the lower left is the strength of the Democrat’s geographic coalition—states where less than 70% of residents say religion is an important part of daily life. This group includes Northeastern states such as Vermont (43% say religion is important), New Hampshire (50%), Maine (50%), Massachusetts (54%), Rhode Island (56%), Connecticut (60%), New York (62%), Pennsylvania (68%), New Jersey (66%), Delaware (66%), Maryland (69%), and the District of Colombia (59%). It also includes Western states such as Washington (56%), Oregon (56%), Hawaii (59%), California (64%), Nevada (59%), and Colorado (61%). A few Midwestern states are in this block as well including Wisconsin (66%), Minnesota (66%), Michigan (67%), Illinois (68%), Iowa (69%), and Ohio (69%). Collectively, these more “secular” states represent 285 Electoral College votes. Only 270 are needed to win the presidency. The upper right portion of the scatterplot represents the strength of the Republican’s geographic coalition—states where 70% or more of residents say religion is an important part of daily life. This group includes Southern states like Mississippi (88% say religion is important), Alabama (86%), Louisiana (83%), South Carolina (82%), Arkansas (81%), Tennessee (81%), Georgia (80%), North Carolina (80%), Texas (79%), Oklahoma (78%), Kentucky (75%), West Virginia (74%), and Florida (70%; voted majority Democrat in 2012). It also includes some states in the Midwest and Western states like Kansas (74%), South Dakota (73%), Utah (73%), Indiana (72%), Missouri (72%), Nebraska (71%), North Dakota (71%), and New Mexico (70%; voted majority Democrat in 2012). Collectively, these more religious states represent 216 of the 270 Electoral College votes needed to win the presidency. The upper left “outlier” portion of the scatterplot includes a set of Republican states where less than 70% of the population say religion is an important part of your daily life and where a majority voted Republican. These states include more rural locations such as Wyoming (60% say religion is important), Alaska (60%), Montana (53%), Idaho (66%), and Arizona (67%). These collectively represent 24 Electoral College votes. There is only one lonely outlier in the lower right segment of the scatterplot—Virginia. Here, 73% of the population say religion is an important part of daily life but only 48% voted Republican in 2012. Virginia is currently what I would call “pocketbook blue.” Voters here in many ways resemble the portrait of other Republican states (rural and suburban with higher religiosity). However, Northern Virginia is a rather unique place. Many residents either work for or contract with the Federal Government. Those who don’t, often work for businesses that cater to and/or need the patronage of those working for the government. As long as Republicans have austerity and shrinking the size of government as one of their top priorities they will not win Northern Virginia, which makes it difficult to win all of Virginia. 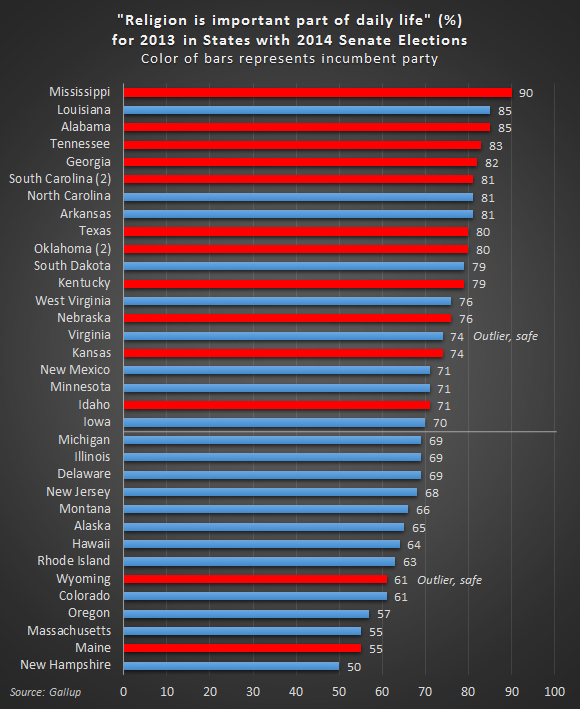 Virginia as well as other “borderline” religiosity states like Ohio (69%), Florida (70%), and New Mexico (70%) are the “battlegrounds” sitting at the fulcrum point of the “God Gap” and American electoral politics and this may have shifted a bit since 2012 (Minnesota and Iowa are now at or above the 70% line). Gallup’s religiosity data for 2013 are shown in the figure below in the states where Senate seats are up for election in 2014. The color of each bar represents the current incumbent party. There are nine seats currently held by Democrats in states where 70% or more say religion is important in their daily lives (“somewhat” or “very” combined). One of these is Virginia, which will remain blue (current polling data suggests a very strong Democratic lead). The other eight seats may be in play. Republicans have only two seats to defend below the 70% line and one of these, Wyoming is a safe outlier. The math and the model seem to indicate an opportunity for Republicans to gain a slim majority.